Description of "Cases in Strategic Management Vol 1-IV "
Why not to worry about competition. Dr. Ritu Srivastava is an Assistant Professor of Marketing at Management Development Institute, Gurgaon, India. She has over 15 years teaching, training research and consulting experience and has published over twenty papers in research journals and has written 15 cases. Currently she is also Chairperson, Marketing area. Ruchi Srivastava is a multifaceted personality with varied interest. She is graduate and post graduate in management and a qualified interior designer. She has extensive experience of web based working and interior design and has given lot of ideas for innovation through interior design. 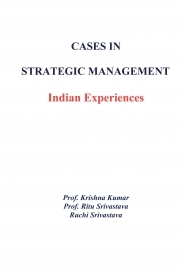 Reviews of "Cases in Strategic Management Vol 1-IV "